A perfect debut novel is like a perfect dress—it’s a “must have” and when you “try it on” it fits perfectly. 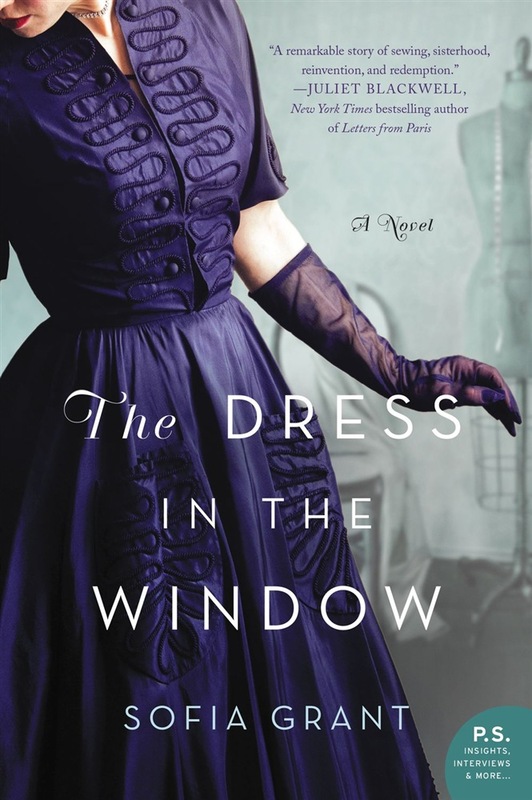 In this richly patterned story of sisterhood, ambition, and reinvention Sofia Grant has created a story just right for fans of Vintage and The Dress Shop of Dreams. World War II has ended and American women are shedding their old clothes for the gorgeous new styles. Voluminous layers of taffeta and tulle, wasp waists, and beautiful color—all so welcome after years of sensible styles and strict rationing. Jeanne Brink and her sister Peggy both had to weather every tragedy the war had to offer—Peggy now a widowed mother, Jeanne without the fiancé she’d counted on, both living with Peggy’s mother-in-law in a grim mill town. But despite their grey pasts they long for a bright future—Jeanne by creating stunning dresses for her clients with the help of her sister Peggy’s brilliant sketches. Together, they combine forces to create amazing fashions and a more prosperous life than they’d ever dreamed of before the war. But sisterly love can sometimes turn into sibling jealousy. Always playing second fiddle to her sister, Peggy yearns to make her own mark. But as they soon discover, the future is never without its surprises, ones that have the potential to make—or break—their dreams. Acquista The Dress in the Window in Epub: dopo aver letto l’ebook The Dress in the Window di Sofia Grant ti invitiamo a lasciarci una Recensione qui sotto: sarà utile agli utenti che non abbiano ancora letto questo libro e che vogliano avere delle opinioni altrui. L’opinione su di un libro è molto soggettiva e per questo leggere eventuali recensioni negative non ci dovrà frenare dall’acquisto, anzi dovrà spingerci ad acquistare il libro in fretta per poter dire la nostra ed eventualmente smentire quanto commentato da altri, contribuendo ad arricchire più possibile i commenti e dare sempre più spunti di confronto al pubblico online.